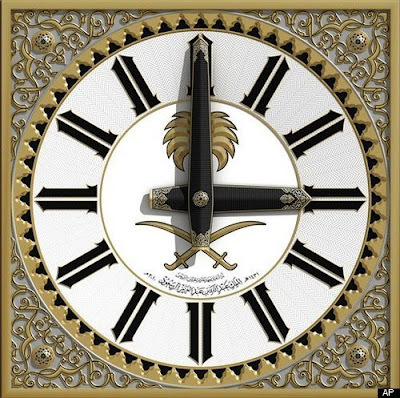 Saudi Arabia has built the world’s largest clock in Makkah measuring an astonishing 151 feet in diameter or six times larger than Big Ben. The four faced clock sits atop what will be the world’s second tallest building (when complete) overlooking the Grand Mosque. Each 151 foot diameter clock face is lit up by 2 million LED lights. On top of the clock are another 21,000 white and green lights that will flash to warn people as far away as 19 miles when it’s time for daily prayers. The clock is being turned on later this week for a three month trial period. 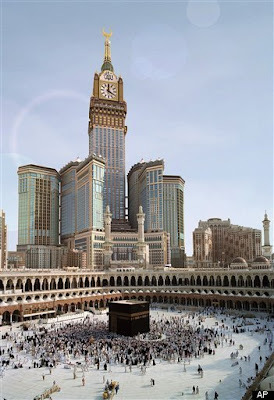 The clock is perched nearly 1750 feet up on top of Abraj Al-Bait Towers which will be 1983 feet when finished, which also makes it the world’s most elevated architectural clocks.